U.S. Highway 66 was established in 1926, was the first major improvement to link the west coast with the nations heartland. Through stories, songs and TV shows, the highway came to symbolize the spirit of the freedom of the open road, inspiring many to see America. 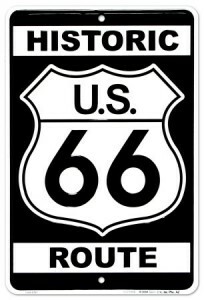 However, the demise of Route 66 began in the 1950’s as the U.S. began it’s interstate highway system, and the highway was officially decommissioned in 1986. Today, small portions of the U.S. Highway 66 still exist in towns and rural areas in several states. This year marks the 19th year of this great radio event. Originally started by the Northern Arizona DX Association, it was a way to allow amateur radio operators a fun way to “Relive the Ride.” They also can relive their own memories of Route 66, and get to celebrate the highway’s rich history in making the U.S. what it is today. Citrus Belt Amateur Radio Club (CBARC) in San Bernardino, CA took over the event a couple years later and has grown into one of the best special amateur radio events each year. Amateur radio clubs using special 1×1 callsigns operate from cities on or near the route from coast to coast. Hundreds of operators worldwide aim to contact as many radio operators as possible who would like to take part in this annual event.